Cascadian Therapeutics Inc (USA) (NASDAQ: CASC) surged 70.51 percent to close at $10.06 on Wednesday after the company agreed to be acquired by Seattle Genetics, Inc. for $10 per share in cash. Global Eagle Entertainment Inc (NASDAQ: ENT) surged 30.77 percent to close at $2.89 on Wednesday after the company reported financial results for first three quarters of 2017. Shutterfly, Inc. (NASDAQ: SFLY) shares jumped 27.81 percent to close at $68.15 after the company reported better-than-expected earnings for its fourth quarter earnings and issued a strong FY18 guidance. The company also reported the purchase of Lifetouch for $825 million. Zafgen, Inc. (NASDAQ: ZFGN) gained 21.16 percent to close at $6.87. Heat Biologics, Inc. (NASDAQ: HTBX) surged 20.14 percent to close at $3.40. Catalyst Biosciences, Inc. (NASDAQ: CBIO) shares rose 19.37 percent to close at $25.39 following release that the company will present multi-dose subcutaneous data for CB 2679d at the EAHAD. Sunesis Pharmaceuticals, Inc. (NASDAQ: SNSS) gained 19.35 percent to close at $5.55. Ply Gem Holdings, Inc (NYSE: PGEM) jumped 18.51 percent to close at $21.45 after the company reported a deal to be purchased by Clayton, Dubilier & Rice at $21.64 per share in cash. Eastside Distilling, Inc. (NASDAQ: EAST) gained 16.92 percent to close at $5.051. OMNOVA Solutions Inc. (NYSE: OMN) rose 15.18 percent to close at $11.00 following Q4 results. Kingtone Wirelessinfo Solutions Hldg Ltd (NASDAQ: KONE) shares rose 14.31 percent to close at $5.35. The China-based nano-cap mobile enterprise company filed a Form 20-F notification of late filing. The company said it "has encountered a delay in assembling the information and finalizing the registrant's Annual Report for the fiscal year ended September 30, 2017 without incurring undue hardship and expense." The company also announced an asset exchange with C Media Limited. Solid Biosciences, LLC (NASDAQ: SLDB) gained 13.87 percent to close at $25.62. Meritor, Inc. (NYSE: MTOR) jumped 13.67 percent to close at $27.28 after the company posted upbeat Q1 earnings. Meta Financial Group Inc (NASDAQ: CASH) gained 13.43 percent to close at $117.00. Meta Financial Group reported Q4 earnings of $0.48 per share. Atomera Incorporated (NASDAQ: ATOM) climbed 12.24 percent to close at $5.50. MGP Ingredients, Inc. (NASDAQ: MGPI) gained11.94 percent to close at $89.54. Pitney Bowes Inc. (NYSE: PBI) rose 11.81 percent to close at $14.11 after reporting stronger-than-expected quarterly earnings. Plantronics, Inc. (NYSE: PLT) shares gained 10.43 percent to close at $58.99 following strong Q3 results. Remark Holdings, Inc. (NASDAQ: MARK) shares rose 10.41 percent to close at $9.65 on Wednesday after falling 17.55 percent on Tuesday. ImmunoGen, Inc. (NASDAQ: IMGN) surged 10.34 percent to close at $9.18. H.C. Wainwright initiated coverage on ImmunoGen with a Buy rating. Knight-Swift Transportation Holdings Inc (NYSE: KNX) rose 9.81 percent to close at $49.79 after the company posted upbeat quarterly earnings. Wabash National Corporation (NYSE: WNC) climbed 9.5 percent to close at $25.83 after the company posted upbeat quarterly earnings. BofI Holding, Inc. (NASDAQ: BOFI) shares rose 7.82 percent to close at $35.97 after the company posted Q2 results. Electronic Arts Inc. (NASDAQ: EA) shares rose 6.96 percent to close at $126.96 after reporting third quarter earnings results. The company issued strong revenue forecast for the current quarter. Bellicum Pharmaceuticals Inc (NASDAQ: BLCM) dipped 25.85 percent to close at $6.08 on Wednesday after the company reported clinical hold on BPX-501 trials in the US. Veritone, Inc. (NASDAQ: VERI) shares fell 23.33 percent to close at $17.75. OpGen, Inc. (NASDAQ: OPGN) shares dipped 23 percent to close at $3.85 on Wednesday. Roadrunner Transportation Systems, Inc. (NYSE: RRTS) dropped 21.99 percent to close at $5.57. Roadrunner disclosed that an internal investigation found that the company overstated its net income by $66.5 million from 2011 through Q3 2016. Forterra Inc (NASDAQ: FRTA) fell 20.84 percent to close at $6.95 on Wednesday after rising 7.07 percent on Tuesday. Goldman Sachs downgraded Forterra from Neutral to Sell. My Size, Inc. (NASDAQ: MYSZ) fell 20 percent to close at $1.92. My Size announced a mixed offering of stock and warrants. Coda Octopus Group, Inc. (NASDAQ: CODA) slipped 19.26 percent to close at $4.78 . Coda Octopus Group reported FY17 net income of $3.339 million on sales of $18.025 million. Fossil Group, Inc. (NASDAQ: FOSL) dipped 13.29 percent to close at $7.96. Eastman Kodak Company (NYSE: KODK) dropped 13.11 percent to close at $7.95. A10 Networks, Inc. (NYSE: ATEN) dropped 12.3 percent to close at $6.13 after the company reported postponement of Q4 results. Quotient Limited (NASDAQ: QTNT) slipped 12.2 percent to close at $2.915. ZK International Group Co., Ltd. (NASDAQ: ZKIN) fell 12.05 percent to close at $8.76 after the company reported results for the fiscal year ended September 30, 2017. Avinger, Inc. (NASDAQ: AVGR) fell 10.81 percent to close at $6.50. Avinger reported a 1-for-40 reverse stock split. Credit Acceptance Corp. (NASDAQ: CACC) shares fell 8.97 percent to close at $329.71 after reporting downbeat Q4 earnings. 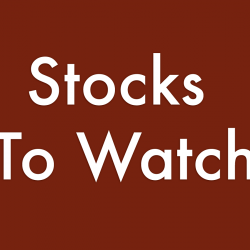 Syros Pharmaceuticals Inc (NASDAQ: SYRS) shares slipped 8.33 percent to close at $9.58. Syros priced 4.19 million shares of common stock at $9.55 per share. Telefonaktiebolaget LM Ericsson (NASDAQ: ERIC) dropped 8.13 percent to close at $6.44 following Q4 results. One Equity Partners reported a deal to buy majority stake in media solutions from Ericsson. AK Steel Holding Corporation (NYSE: AKS) fell 7.83 percent to close at $5.06. Bank of America downgraded AK Steel from Buy to Underperform. Juniper Networks, Inc. (NYSE: JNPR) shares dropped 7.66 percent to close at $26.15 despite a fourth quarter earnings and sales beat. The company issued weak first quarter earnings and sales guidance. Juniper also reported a $2 billion buyback plan and raised its quarterly dividend from $0.10 to $0.18 per share. Super Micro Computer, Inc. (NASDAQ: SMCI) shares dropped 7.4 percent to close at $22.825 after the company reported preliminary results for its second quarter. Supermicro named Kevin Bauer as CFO. Cerus Corporation (NASDAQ: CERS) shares slipped 6.93 percent to close at $4.43 after the company reported a $50 million common stock offering. SunCoke Energy, Inc. (NYSE: SXC) slipped 6.88 percent to close at $11.10 following Q4 results.